Synopsis: Bruce Conrad (Robert Alda) is an American living in a small Italian village. He makes a living partly by fleecing American tourists with "antique" stones, and partly by ingratiating himself to Francis Ingraham, a wealthy musician who owns a mansion in the village. Ingraham is in poor health, confined to a wheelchair, and he only has the use of one hand. As a concert pianist this is immensely frustrating for him. But Conrad, himself a musician, has composed for him a number of pieces that can be played with one hand, something which gives Ingraham some measure of comfort. 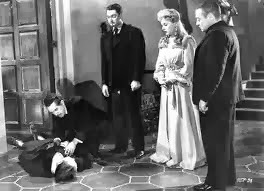 One evening Ingraham asks his nurse Julie, his long-time secretary Hilary (Peter Lorre), his attorney Dupreix and Conrad to join him over dinner. He asks each of them if they consider him to be of sound mind, and they all agree that he is. He then asks them to sign a document naming them witnesses to a new will that he has written. It is clear that Ingraham is in love with Julie. So is Conrad; and he tries to convince Julie to come away with him, even though he knows that he has no money and no prospects. Ingraham, he admits ruefully, is the meal ticket for all those around him. Conrad lives off his largesse; Julie is on his payroll, as is Hilary; and there's no doubt that Dupreix depends on Ingraham for much of his business. But Hilary has overheard Conrad's conversation with Julie, and he immediately goes and tells Ingraham about it. Ingraham, thinking that Hilary is trying to turn him against Julie, seizes Hilary's throat, choking him. Hilary manages to escape, but is left with ugly marks on his neck. Ingraham tells him to get out of the house. Late that night there is a tremendous thunderstorm, and Ingraham, calling in vain for Julie, brings his chair too close to the top of the stairs. The wheelchair tips and Ingraham takes a fatal fall down the long staircase. The discovery of the body is a great shock to the community, and soon Ingraham's only living relatives show up -- Mr. Arlington (Charles Dingle) and his son Donald (John Alvin). The two immediately start taking an inventory of the house's contents, clearly with the idea of liquidating them. This angers Hilary, who claims all the books in the library belong to him, that they were gifts from Ingraham. But when the will is read everyone is shocked to discover that Julie has been named as the sole heir. The Arlingtons are furious, and vow to contest the will. Dupreix secretly meets with the Arlingtons and agrees to support their claim in exchange for a cut of the estate. Comments: We've noted in the past that Warner Brothers didn't dabble in horror movies very often, and on the rare occasions when it ventured out into the boneyard the results were disappointing. 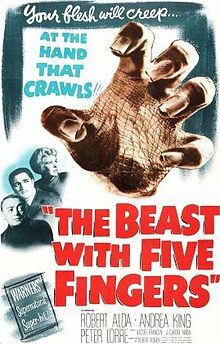 Tonight's feature, The Beast With 5 Fingers, has already aired a few times on Horror Incorporated. Like Warner's curious misfire The Return of Dr. X, this movie is evidence that horror is a surprisingly difficult film genre to do well, one that shouldn't be attempted by those who don't like or understand it. I admire Beast's overall look and set design, and the cast is appealing, especially Peter Lorre as the excitable and increasingly unbalanced Hilary. As a mystery, it's a little slow out of the gate, but nevertheless it is on fairly solid ground through most of its running time. But in the third act it falls apart rather spectacularly simply because it can't take its own premise seriously. Probably the best thing that can be said about a crawling-hand monster is that it's a cheap effect to do -- even the process shots are simple. But then again, a good script is the foundation upon which any movie is built, so thrifty effects only get you so far. As both The Beast With 5 Fingers and The Crawling Hand amply demonstrate. Synopsis: The city is being terrorized by a spine-snapping brute called The Creeper (Rondo Hatton), a grotesque character who prowls the streets at night and seemingly kills at random. The police are under enormous pressure to capture him, but so far they don't have a name, or even a clear description. One night the killer strikes again, and this time his victims are a professor at Hampton college and a woman named Joan Bemis, whom the Creeper seems to know. 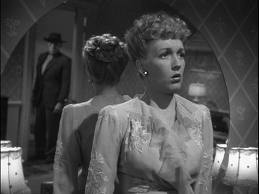 The police manage to corner their suspect in an apartment house; in order to escape, the Creeper enters the apartment of a young woman named Helen (Jane Adams). Because Helen is blind, she isn't repelled by his appearance. He asks for her help, and she agrees, saying that she has a gift of sensing a person's true nature. When the police knock on her door, she tells them that she hasn't seen anyone suspicious in the area. Helen knows only that she's met a man who is in some sort of trouble, and she is certain that he is innocent of whatever he's been accused of. For his part the Creeper is glad to know someone who doesn't scream and run away when he enters the room, and a rather unlikely friendship ensues. Soon enough the Creeper has murdered a delivery boy who brought groceries to the waterfront storage shed he's been living in. Here the police discover an old newspaper clipping of three college chums, circa 1930: Clifford Scott, Virginia Rogers and Hal Moffat. When the police look for Clifford Scott and Virginia Rogers they discover the two are now married; and that the third person in the photo, Hal Moffat, was Clifford's college roommate as well as a rival for Virginia's affections. The late Joan Bemis was also a close friend of the trio. A star athlete, Hal's face was hideously disfigured in a lab accident. The accident seems also to have affected his "glands and nerves", not to mention his mind; because all these years later Hal has decided to get revenge on all those who spurned him in college. Meanwhile, learning that Helen needs $3,000 to pay for an operation to cure her blindness, Hal decides to get her the money -- even though he knows that she will be repelled by him if she's able to see him. Nevertheless, he goes to Clifford and Virginia and demands money. Clifford gives him a box of expensive jewelry, but manages to put a couple of .38 slugs into him before he's murdered himself. Comments: The Brute Man is spectacularly forgettable, notable only as a Universal horror film that was completed just as the curtain was ringing down on the studio's so-called golden age -- and, in fact, a movie so embarrassing that it was ultimately sold off to PRC for distribution. It was also the last film to star the hulking Rondo Hatton, whose glandular condition (acromegalia) had deformed his features enough to give him a repulsive, brutish appearance. Hatton had no acting talent to speak of, but after a memorable turn in the Sherlock Holmes programmer The Pearl of Death (1944) as a character called "The Creeper", Universal tried to build him up as a one-man horror franchise. He appeared as Gail Sondegaard's creepy manservant in The Spider Woman Strikes Back (1946) and then, in a nod to the character he played in The Pearl of Death, as The Creeper in House of Horrors (1946). In this film he was a skulking killer who snaps people's spines. House of Horrors was a smart little movie, and The Creeper was brought back (in what we might today call a prequel) in The Brute Man. The Brute Man attempted to up the ante by providing a tragic backstory for the character of The Creeper and giving him more screen time than he had enjoyed in the past, but producer Ben Pivar's dream of making The Creeper part of the Universal monster pantheon was clearly doomed from the start. It turns out that The Creeper might be an interesting fellow to see skulking in the shadows near the waterfront, but a little goes a long way. We don't really want to know his life story, and we don't want to spend a good chunk of the movie hanging around with him. 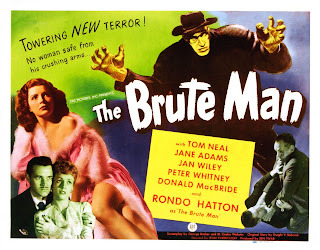 Moreover, Rondo Hatton died while The Brute Man was still in post-production. Even if he had lived, it's unlikely that The Creeper franchise would have been long-lived; horror films were falling out of fashion, and television -- which would soon run the poverty row houses into extinction -- was already looming on the horizon. 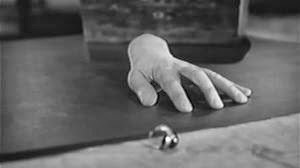 THE BEAST WITH FIVE FINGERS has a disappointingly conventional conclusion, and the oddball THE CRAWLING HAND also ends in weird fashion, as the astronaut's hand is devoured by a grimy alley cat. There is now a book on Ben Pivar, titled STOP YELLIN, after a Creeper line from HOUSE OF HORRORS, and it's a very nice read. Just the story behind Universal's 'B' factory during its busy wartime period. I hadn't heard of STOP YELLIN', and I've ordered a copy -- looks very interesting! I always suspected the ending of THE CRAWLING HAND influenced the even-more-incompetent THE INCREDIBLE MELTING MAN, wherein the unlucky melty astronaut,who has been staggering around killing people the whole picture, finally deliquesces into a layer of slime next to an open garbage can. MELTING MAN featured the early makeup effects of Rick Baker, the only reason to see it!